LOCATED IN THE HEART OF CAJUN COUNTRY, LOUISIANA, CAJUN MARKET DONUT COMPANY OFFERS FIVE LOCATIONS IN THE ACADIANA AREA. 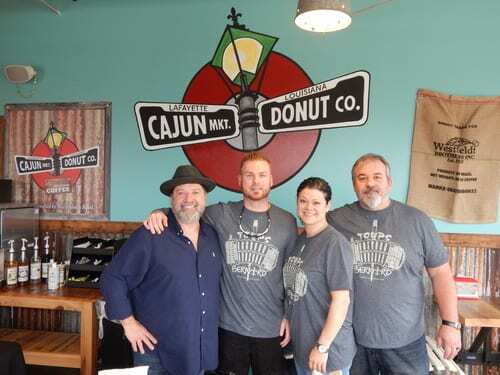 Staying with the flavors that made him successful, Cajun Market Donut Company still offers all the classic variety you would expect from a donut shop. From melt-in-your-mouth glazed donuts to cinnamon rolls to red velvet cake donuts, Cajun Market is sure to have the sweet treat you’re craving. It’s Mardi Gras all year long at Cajun Market Donut Company! From January thru Mardi Gras, Cajun Market offers king cakes made fresh daily. The rest of the year king cakes can be ordered (24 hour advance notice) for any occasion in your choice of colored icing and filling. Great for birthday parties and holidays! Things get spiced up in the mornings at Cajun Market Donut Company. Offering kolaches (Pig-in-a-blanket to you Yankees), Cajun Stuffed Breads, and our NEW Signature Donut (to be named later once we come up with something witty and clever), Cajun Market is certainly ready, willing, and able to beat down your morning hunger.